=You got a souvenir for me? Hi everyone! I’m back from Hawaii! I had a great time there. とても楽しかったです！= Totemo tanoshikatta desu! I said 「ただいま！」= “Tadaima!” = I’m back! Many people tweeted 「おかえりなさい！」= Okaerinasai! =Welcome back! to me on Twitter. This expression is used not just to welcome someone back from a trip, we also use this to welcome our friends, families and coworkers back every day at home or at the office. Yes! If you leave work and go out to do some errands, when you come back someone will greet you with 「おかえりなさい!」＝Okaerinasai! (When you leave your house or office, we say 「行ってらっしゃい 」= Itterasshai. Go check my mini lesson ! = So did you get a souvenir for me? We often ask this question jokingly to a person who just came back from traveling. it is actually customary to buy souvenirs or gifts for your family, friends and/or coworkers when you travel. OK, since I just came back, why don’t we study some travel related Japanese at the airport and on the airplane. 旅 = tabi is more literal. 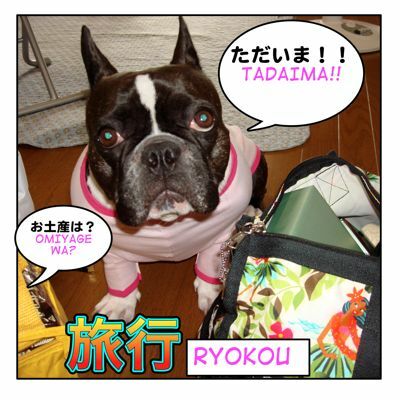 In daily conversation, we use 旅行 = ryokou more. Note : Do you know the main 国際空港 = kokusai kuukou = international airports in Japan? = Achira no kauntaa de chekku in shite kudasai. = Please check in at the counter overthere. = Passupooto to koukuuken wo onegai shimasu. = Please give me your passport and air ticket. = Naka ni kowaremono ya ekitairui raitaa wa haitte imasenk ka? = Is there anything fragile, any liquids or any cigarette lighters inside? = Oazuke ni naru onimotsu wa ikutsu desuka? Kono futatsu desuka? = How many bags will you be checking? These two? = I would like to check this in as well. = Zenbu de futatsu desu. = Two bags in total. = Kagi wa kakatte imasuka? = Is this locked?/ Are they locked? = Ie, kagi wa kakatte imasen. = No, it’s (they are) not locked. = Rokkiro juuryou oobaa desu. = It’s 6 kg over. = Soredewa naka kara sukoshi toridashite nimotsu wo wakemasu. = Then I will take some out and separate the luggage. = Soredewa nimotsu wo futatsu ni wakemasu. = Then, I will divide them in two. = Kore wa (kinaini) mochikomemasu ka? = Can I hand-carry this? = Ozaseki wa tsuuro gawa to madogawa to dochiraga yoroshii desuka? = Do you prefer a window seat or an aisle seat? = Tsuurogawa no seki wo onegai shimasu. = Nijuu hachiban geito wa doko desuka? = Where is Gate 28? = Nanban geeto kara demasu ka? = Which gate do we leave from? = Koukuu gaisha wa dochira desu ka? = Which airline do you use? =What is your flight number? =Toujouken wo omise kudasai. = Please show me your boarding pass. = Taizai kikan wa dono kurai desu ka? = How long are you going to stay here? = Taizaisaki wa dochira desuka? = Zeikan shinkokusho wa omochi desuka? = Do you have a tax declaration form? = Shinkoku suru mono wa arimasu ka? = No, nothing to declare. = Saa nihon ni kuru junbi wa dekimashita ka? Tanoshii tabi wo shite kudasaine!! OK, are you ready to come to Japan now? Have a nice trip! Are all of these correct? All good but I would say 1 sounds a little unnatural. How can we say to travel around somewhere. Like “I want to travel around South Africa” as opposed to just traveling to a single place in South Africa. In that case could we use を? I think that’s how it can be used for other verbs like walking. eg. 待ちを歩いてた. Me and my wife are just back from Japan (we wish we could go back today!) and are planning to print a “celebrative” photobook. We would like to entitle it “Jan and Maggie’s travel to Japan” (yeah, you share the same name! :D ). How do you say “I took a [transport] to [location]”? e.g. I took a plane to Tokyo. I have a question about “ryokou suru”. Are they both correct ? Is there a difference ? Can we also use ‘furansu he ryokou suru’ ? Don’t they both mean the same thing? And if they both mean the same thing, why does 旅行 exist and why is it used more commonly? I’m sorry, please explain it again! As I said 旅 is more literal. It is also used to describe some process or experiences of growing in lief. How do you say, Casher (where you pay for sth, like an excess bag) and Ticket Sales (where you buy tickets or change sth in your reservation)? And also,how would you say “go straight ahead, and at the first counter turn left to go to inmigration”. sorry if this post was made three times, for some reason the window froze. = Onimotsu no choukaryoukin wa achira no kauntaa de oshiharai kudasai. = Kono mama massugu osusumi itadaki saisho no kauntaa wo hidari ni magari nyuukoku shinnsa no hou ni irashite kudasai. I was wondering, how would you say that a flight was cancelled or that they have to take a flight at another airport? (I work at the international airport and sometimes due to the weather the flights departure from the domestic airport). Oh you are actually working for an airline company. I am very happy to hear my vocab. list is helpful.But I guess my lesson is for the passengers, huh? = Okyakusama no bin wa akutenkou no tame kekkou ni narimashita. = Your flight has been cancelled due to the bad weather. You can switch the reason. = Taihen moushiwake gozaimasen ga kokunani kuukou yori onoritsugi wo onegai shiteorimasu. = We are very sorry but we ask you to take another domestic connecting flight from the domestic airport. But of course, you need to add more information, the airport name, what kind of connecting flight they should take and etc. Feel free to ask me any other sentence patterns if necessary. About the question on taking the flight at another airport, I meant that at our domestic airport we also have international flights but only to neighbouring countries. Sometimes due to the bad weather, international planes (the ones that are not too big) may be able to land at o departure from the domestic airport. Ah I see. Then how about this? = (Sanji sanjuppun ni) Narita iki no bin ga ~~ kokunai kuukou kara demasu node sochira no hou ye (shatorubasu de) idou kudasai. = Please go to ~~ Domestic Airport (by our shuttle bus) where you can take the 15:30h flight to Narita. You’re very welcome and Good luck!